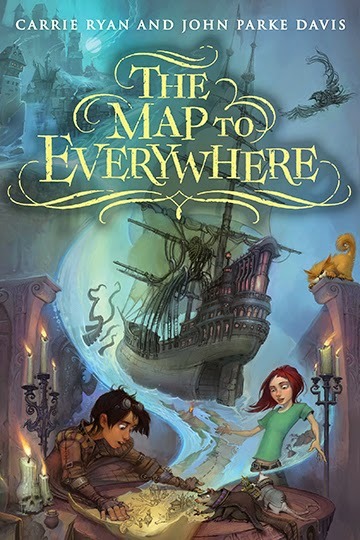 I’m so excited that it’s finally release week for The Map to Everywhere, the first in a four book middle grade fantasy adventure series I’m co-writing with my husband, John Parke Davis! YAY! In honor of the release, I wanted to share a bit about the origins behind the series because this entire journey really has felt like a dream come true. From an early age I knew I wanted to be an author even though I wasn’t really sure how one became such a thing. During my final semester in college I realized that if I wanted to write for a living, I’d better get started actually writing something I could sell. So I picked up a romance novel I’d begun drafting years before. I finished that book in 2000 and shopped it to agents, and while I got a few positive responses, nothing much came of it. I then wrote a second romance but by that time had come to the realization that perhaps I needed to look into a more stable career. So I went to law school. Classes had only just begun when I found myself sitting at the apartment complex pool one day reading my torts textbook. A fellow first year law student named JP said hello and we got to talking. It didn’t take long for us to realize we had a lot in common — we’d both been born and raised in South Carolina, we both enjoyed the outdoors, and we both loved to write. A year later, JP and I began dating. Upon graduation we moved to Charlotte together to start careers in law. It didn’t take long for me to realize, however, that while I’d loved the study of law, the practice wasn’t as exciting. And so I asked myself: if I could do anything with my life, what would it be? The answer: I’d be an author. But I hadn’t been doing much in the way of fiction writing over the previous years. At the same time, JP also realized that he wasn’t writing as much as he wanted. So together we decided to change that. I committed to writing a book a year for ten years in the hope that by the end of a decade I’d have sold one and started a career as an author. JP committed to a project with his brother called The Story Game. The premise was simple: every week one of them would throw out a pitch and they’d have a week to write a two page story centered around that pitch. This project spawned some amazing stories — some of which JP later sold, one of which inspired my first published novel, The Forest of Hands and Teeth, and several that I thought would make amazing novels. But one story had always stood out to me. It was about a wizard and a ship’s captain sailing a river of pure magic called the Pirate Stream. It was the kind of story that reminded me of what made me fall in love with reading as a kid, and my first thought was that it would make an amazing middle grade book. I really, really wanted this book to exist and I really, really wanted to be a part of it. It had so completely taken hold of my imagination that I proposed we co-write it. And for years, all we did was talk about it. During long walks we’d discuss character or plot, we’d share bits of stories we’d loved growing up, and we’d talk about how one day we’d really have to sit down and start writing. I’m not sure that I ever expected that day to come, but in early 2012 I was looking for a new project to focus on and I said, “Let’s do it. Let’s write the Pirate Stream book.” JP readily agreed but even so, it still felt like a bit of a lark. Besides, who knew if we’d even be able to write together — sure we’d been integral parts of each other’s writing process as first readers and editors, but it’s another thing altogether to be co-writers *and* spouses. And then we started writing and it worked. Like, it *really* worked. We built off each other and the story grew in really amazing and unexpected ways. We were able to assert our ideas without overwhelming one another and compromising came much easier than expected. Plus, it was fun! By the end of the year, we’d sold it in a four book deal and this week, that first book — The Map to Everywhere — hit shelves. Often I think back to that moment in 2006 when we both sat down with the goal of being able to make a living writing in ten years. I’m not sure either of us would have expected our paths to lead us here, and certainly not as co-authors of a middle grade series. Truly it has been a collaborative effort in every sense of the word. When one of us felt that our goal may not be within reach, the other was there to keep the faith. And at the heart of it all is our mutual love of story and of each other. This post originally appeared on Magical Words.